METAFECTENE® FluoR transfection reagent presents a method for visualizing the path of the carrier system through the eukaryotic cell and gaining new information from the transfection process, such as findings on the localization of specific components. The lipid composition (as liposomes) of METAFECTENE® FluoR is based on METAFECTENE® PRO and contains a covalent rhodamine B label which is designed not to impair the transfection process. METAFECTENE® FluoR is designed for transient transfection of mammalian cell lines and primary cells with DNA (plasmids, bacmids). 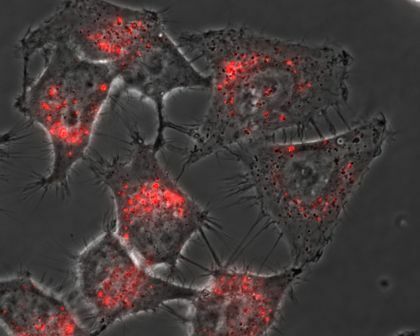 By the fluorescent label endocytosis of the cells can be analyzed under the fluorescence microscope. But it is also suitable for other nucleic acids like RNA (mRNA, miRNA, and siRNA), and modified nucleic acids (antisense oligonucleotides). 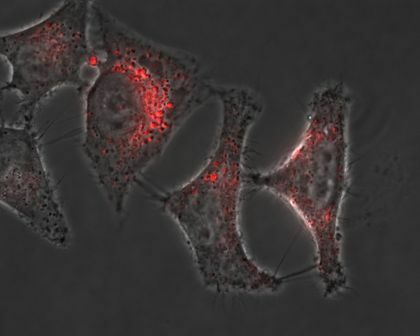 The two images below show cells transfected using METAFECTENE® FluoR and pCMV-eGFP. They clearly show the endocytotic uptake of red fluorescent lipoplexes in the cells and their perinuclear accretion. In addition, the superimposed shots of the fluorescence channels enable you to view the incipient expression of GFP by moving the cursor over the desired image.